Imagining academic support for postsecondary students may bring to mind notions of tutoring and study groups. While Laurier’s services to support student success include these proven traditional methods, Laurier has a far more intentional approach to reaching learners and enhancing their academic experience during their time at university. Student support, faculty support, educational advising, experiential learning and career development teams collectively represent Teaching and Learning at Laurier. This purposeful collaboration of teaching and learning units is uncommon in higher education and emphasizes the value all areas contribute to high impact support practices. 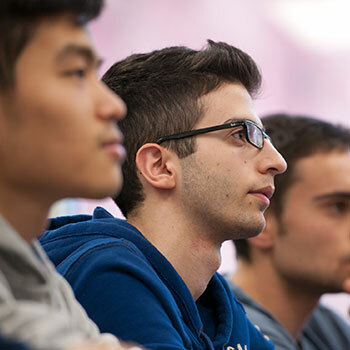 Laurier’s student academic success initiatives, which include support for learning styles, mathematics, study skills, writing development, as well as accessible learning, help Laurier students to develop educational plans to achieve their academic and life goals. With tailored programming for varsity athletes, Indigenous students, and academically at-risk students, there is a recognition that the approach to student support can’t be prescriptive. Professional staff, many of whom have experience teaching within a university setting, develop and deliver programs in partnership with faculty and service providers, and with the support of trained undergraduate and graduate students. Most of these multi-campus services are delivered in the classroom or linked to the classroom. Small group and individual consultation settings encourage participants to share ideas and learn from peers. “The atmosphere encourages you to try new things and learn from both your successes and challenges,” says Esther Brockett, a fourth-year student pursuing an honours BA in biology and global studies. Brockett has been a writing tutor since her first year and was recently selected as a Headstart ambassador. She credits her foundational understanding of university writing styles and conventions to the writing support services she received in first year. Brockett and members of the Laurier Undergraduate Journal of the Arts worked collaboratively with writing consultant Jordana Garbati to prepare a conference presentation as well as a paper submitted for publication. Formalized peer-to-peer programs such as facilitated study groups and supplemental instruction sessions provide leadership positions to qualified students and benefit both the students leading the sessions and those participating. Even drop-in sessions with professional staff are focused on developing tools and identifying students’ strengths so they can actively engage in their course work. “It’s about empowering students to take ownership of their learning, rather than giving them the answers,” says James Southworth, a Laurier writing consultant on the university’s Waterloo campus. In addition to writing supports, there are a variety of mathematics supports offered to students through Laurier’s Math Assistance Centre. Services range from mock tests and exams to online calculus preparation exams and online pre-calculus modules. Many of these academic services, such as the pre-calculus modules, are embedded directly into courses at Laurier. The workshops and assessments are developed and delivered in collaboration with instructors. “Rather than being interchangeable with tutoring services, our model is scalable and reaches students in the classroom where these skills are exercised,” says Forsyth. Integrating tools and resources such as time management, writing, and presentation skills in classroom and online courses extends access to a more diverse range of students and enhances the experience for all students. In-class workshops offered through the Writing Centre use active learning to help students identify their own strengths and provide skill sets that have cross-disciplinary relevance.